This is Part 3 of the series: “Shoddy Workmanship: Why 90% Of Leaders Are Average Or Worse” updted from an article originally posted on LinkedIn. The most common leadership style is inhibiting the success of companies and diminishing the morale of employees. It is leadership that looks like a duck, quacks like a duck, but it is not a duck. This style masquerades as great and clever leadership when it is actually barely acceptable. It underwhelms opportunities and falls far short of creating the engagement and innovation of which most companies and employees are capable. The most common leadership style is expedient leadership that is sometimes appropriate but when used regularly only produces acceptable, never great results. Yet most leaders (and companies) are willing to settle for this style of leadership because it gives the illusion of progress. This style deceives companies and leaders into thinking that they are much better than they really are so that substantial progress is impossible. This common leadership style strangles the workplace because when it is used by organizations are maintained but are not enhanced. 3. Nearly one in five (18%) of people currently in management roles demonstrate a high level of talent for managing others, while another two in 10 show a basic talent for it. Companies fail to choose the candidate with the right talent for the job 82% of the time. As a result, time and resources are wasted attempting to train bad managers to be who they’re not. Nothing fixes a bad leadership selection. The best one can hope for after a bad selection is made is mediocre leadership which is what many corporations are experiencing. Leadership behavior is driven by philosophy. Consciously or unconsciously, what leaders believe about work and people drives the style they use to lead others. 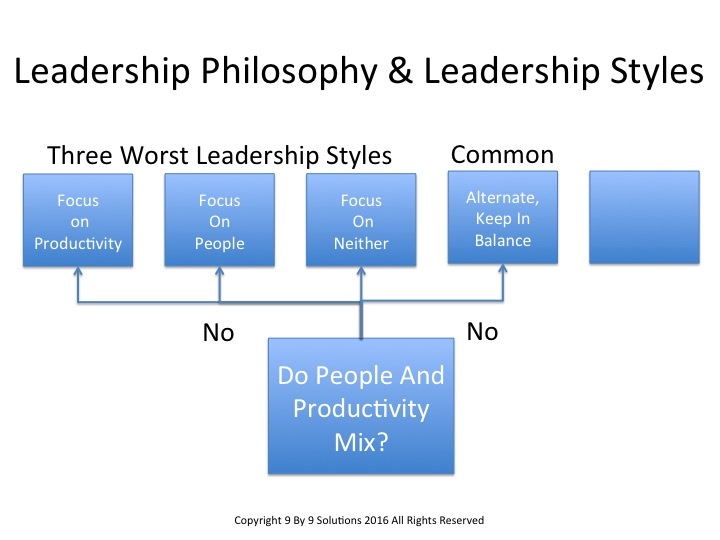 Douglas McGregor’s work, (https://9by9solutions.com/2016/12/shoddy-leadership-90-of-leaders-are-average-or-worse-why/) on leadership philosophy defines the key leadership question as “Do people and productivity mix?” Depending on how this question is answered, a leadership style follows. In Part 2 of this series we reviewed the three leadership styles that arise when a leader answers McGregor’s fundamental question, “No”. The next style is the pragmatic approach. It is the most common leadership style. It is the result when most leadership development programs that fall far short of developing leadership greatness. It is the style encouraged and rewarded by most organization cultures. It is the style that best defines the management cultures of most organizations. 1. 63% of employees worldwide are not engaged in their jobs. They don’t hate their jobs, and aren’t necessarily negative — they’re just there (Gallup). This statistic, more than any other, defines the impact of common or average leadership. 2. Better leaders make a difference. Their most significant impact is in their ability to support and teach workers in how to be more productive, i.e. capability building. (The National Bureau of Economic Research Working Paper). We know that if we cannot define a problem, we cannot solve that problem. Thus we need to realize that, in the words of Pogo, the old-time cartoon character, “We have met the enemy and he is us”. 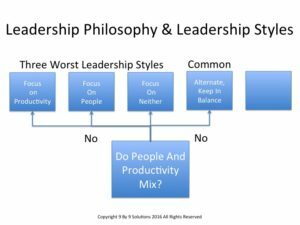 Managers who practice the most common leadership style seldom, if ever, consider McGregor’s’ leadership philosophy question (do people and productivity mix?) but if they did they would quickly concur by answering this question “Yes”. To this leader the answer is a no brainer; everyone knows both are critical to success. However, there is an important caveat. Yes, people and productivity are important but the way this leadership style attempts to achieve them falls far short of optimal. The problem is that this style believes that there is a time in organization life where a leader must be concerned about productivity and a time when that leader must be concerned about people. This style believes a concern for productivity and people must co-exist but this style does not believe that the two are integrated except in very rare occasions. This style is a “silo” style, separate but equal, approach to leadership. This leadership style is pragmatic. It believes that in the real workplace world concerns for people and productivity are separated but balanced. The pragmatic leader looks at people and knows that people are critical to high performance. Employees have needs, concerns and desires that must be met. They want to grow and contribute. This leader knows he or she must pay attention to people because people have the talent that must be tapped to get the organization’s work done. At the same time this pragmatic leader acknowledges that high performance is critical to an organization. Without this high performance, no organization would exist for long. These different concerns, in the mind of the pragmatic leader, are incompatible. This leader does not believe that it is possible for any leader to simultaneously integrate a high productivity focus with a people focus in every leadership situation that is faced. The only logical option in this leader’s mind is to ensure these two concerns are kept in balance. While neither concern can be ignored, they must be managed separately. The fact that this is the most practical leadership style so far is the reason it deceives so many leaders. Pragmatic leaders do not want to opt for the extremes. They are not comfortable as a fire-breathing autocrat or placating people. These leaders want to do their job well and to achieve their people and results responsibilities. The problem is that this leader does not understand that using a pragmatic leadership style falls far short of the high achieving leader. Workable is their standard of excellence. Interestingly enough these leaders believe that one leads by holding staff to high levels of performance while holding themselves to a standard of expediency. Today leadership is in real disrepute. We want to blame the fire-breathing autocrat or uninvolved mentally retired leader for this sad state. The problem is that does not explain the widespread research studies found that report that lack of trust is pandemic. These findings trouble many leaders who feel they are honest, treat people well and should be trusted. They cannot understand why their integrity is in question. One of the major reasons for low trust in leaders stems from this most pragmatic style of leadership. At its core this style does not believe or act as if people and productivity mix. Therefore people do not see demonstrated in this leader’s behavior any evidence that the respect and value employees these leaders claim to have is practiced. In the employees’ minds this is dishonesty at the core. It is critical that leaders understand the major source for employees lack of leadership trust is due to the most common, compromising, pragmatic and expedient leadership style! It is not always angry, unethical leaders who are the sources of distrust but it also happens with well-meaning but compromising managers who do not practice what they preach. There are five techniques this pragmatic leadership style uses to resolve the people-productivity mix. All are pragmatic, based on compromise, and settle for workable, rather than seek optimal solutions. First, this pragmatic style attempts to keep in balance a concern for people and a concern for productivity. This is probably the most common leadership technique today because it is viewed as realistic and “fair”. It is what this style of leadership believes the real world requires. This pragmatic style understands that in the course of work tough decisions or actions have to be taken. These actions may or may not be the best for employees but they are what organizational productivity and results require and besides, these decisions belong to leadership. So leaders make these decisions and determine what they must do. After these tough “management” actions are determined, the pragmatic leader then considers how to bring employees into the equation. This style wants to ensure that both sides are balanced so tough productivity actions are followed by actions to keep people’s spirits and morale up. For example, a pragmatic leader might “chew out” an employee for poor performance, but then visit that employee by the end of the day to be sure the employee is ok, to joke with them or to discuss their family (being sensitive and concerned are always good people skills!). The leader wants to demonstrate that the employee is still in the leader’s good graces and that the earlier action was not personal, just business. The leader’s real goal? Balance the scales. A tough result or cost decision must be balanced by a separate action for people Unfortunately the pragmatic leader does not understand the stress this style places on staff or the damage it does to the leader’s integrity. The second way a pragmatic manager operates is by watering down actions from optimal to workable. The average manager believes optimal is nice but exists in theory only. The real world is pragmatic. Optimal solutions often take too long or cost too much so workable solutions are usually good enough. The pragmatic leader wants to gain a workable solution, check this item off the to-do list and move on. This often leaves staff frustrated as they have heard this leader talk about the quality work the unit does. Yet staff realizes this kind of behavior is evidence that quality is not the focus. The third way the pragmatic leader settles for workable is by allowing consensus to substitute for true engagement and collaboration. When trying to define the best option, the pragmatic leader wants everyone’s buy-in; so all ideas and desires are treated equally in considering which solution is best. This leader solicits input from a wide range of sources (not a bad thing). The leader tries to incorporate items that are important to each person or group. The problem is these desires or objectives are never prioritized so that ultimately all objectives are equal. Ultimately the solution this leader will accept ends up consuming more time and resources to implement (because of the expanded scope). The problem is the solution, by trying to meet everyone’s objectives, will produce either watered down results. This is the typical way the government political process works. Workable (never optimal) solutions are produced at higher than necessary cost, as everyone’s objectives are included to curry support. This approach also bastardizes true employee engagement and partner collaboration as this leadership style lowers the vision to expedient from optimal. Today many thought leaders present this leadership approach as clever. One Stanford University professor discussed the beauty of compromise and how this should be the approach of every manager. What this professor failed to understand is that when a leader starts out by seeking compromise, optimal is discarded almost immediately. Soon the objective, which may have been very significant, is watered down to a mere shadow of what it might have been. Sure it might be implemented but expedient decisions that do not produce significant results have a way of destroying budgets. As a result, a workable result may be obtained, but it will definitely not be a great one. As we will see in a later discussion, the target of the high achieving leader is always optimal. Compromise is only considered when optimal becomes impossible. There is a fourth, and dangerous way, that the pragmatic leader operates. This leader may espouse certain values or beliefs but in the name of expediency, set those values aside when it becomes difficult to solve a problem because of them. This is situational leadership at its worst. While this compromise primarily applies to values or ethics, it is also seen in what these leaders say about their concern for people. Typically people values are compromised in the light of tough productivity decisions. (This also happens with decisions about how customers will be treated). After all, the pragmatic leader believes that “these exceptions prove the rule” and besides they can eventually balance the scales by making up to the people later. The fifth and final technique the pragmatic leadership style uses involves underwhelming their leadership duties. Pragmatic leaders give about 80-90% effort to their leadership functions but consistently to go the last 10-20% that would have achieved optimal. Take for example the leadership task of giving employees performance feedback. Instead of a direct honest two-way discussion of what was done well, what was not done well, and what should change, the pragmatic leader gives the some positive feedback, followed by some negative feedback and ending with some positive feedback. After all, you always want the employee to leave on a high note, right? Feedback was given so the leadership task was fulfilled but the foundation for employee growth and development was not laid. When a leader consistently underwhelms leadership duties across all leadership tasks, the leader quickly falls to a workable (barely) version of what leadership should be. Excellence is never achieved. What Are The Consequences Of This Most Common Leadership Style? The pragmatic style of leadership is the most dangerous style of all because it deceives average leaders into thinking they are great leaders. Over time, this style meets day-to-day demands but it never produces the change or innovation to become significantly better (for the organization or people). This leadership style is represented by the equation, 1 + 1 = 2. When all the time and all the resources under this leader style are mixed with this leadership style, it takes all the organization’s energy to meet its daily goals. The greatest indicator of pragmatic leadership is that over time the average company, its managers and its people remain basically the same. While there is a facade of success, this changes little. There is little or no significant growth in capability, innovation or synergy that moves the company to the next plateau. Employees soon realize they are becoming stagnant in their professions and careers; they feel they have learned all there is to know under this leadership. Eventually they use the knowledge and experience they have gained, as a stepping-stone to move to a company where they hope their skills will be better optimized. Pragmatic leaders are often stunned at how well ex-employees do at new companies but they usually blame everything and everyone but themselves for the failure to retain talent. Moving from average leadership to excellent is not easy. Becoming a high achieving leader is one of the most significant achievements of any manager. In an organization is a significant accomplishment that produces results that remain long after that leader has departed. •	Most leaders who read this article will think it is the other guy who is average and pragmatic. (See https://9by9solutions.com/2015/10/30-of-american-leaders-are-considered-great-how-do-you-know-if-you-are/.) The great majority of time they will be wrong! •	Because organizations have multiple managers with varying styles, most organizations are statistically using a pragmatic style. This means that most high achieving managers are performing in a less than receptive organization culture. •	The key to learning to become high achieving leader is to learn to behave like one. Pragmatic leaders must be willing to give up their shoddy leadership practices and learn how to behave like high achieving leaders. This takes a strong dose of humility which is a barrier to most expedient leaders because they have attended leadership development courses and can tick that box off the “to do” list. Learning to truly apply those skills is that last 10-20% which for the expedient leader is not worth the effort. This article gives excellent lessons about leadership. It reflects Doug Wilson’s great experience and know-how on effective leadership and current problems in the organizations in the business world. Thank you Doug Wilson for sharing such valuable article with us.